For Mirza Abul Hassan Khan see Richard Dighton, SP.222. 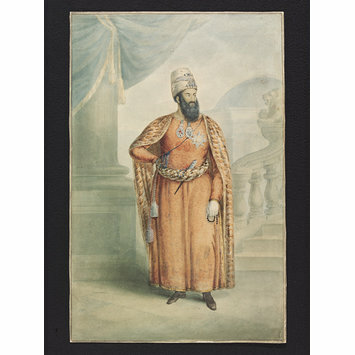 This may be a copy after the painting of Mirza Abul Hassan Khan that Gauci exhibited at the RA in 1820 (602). It seems to be based on his lithograph of 1819 (SP.286), although the head faces the other way and the positions of the hands have been altered. 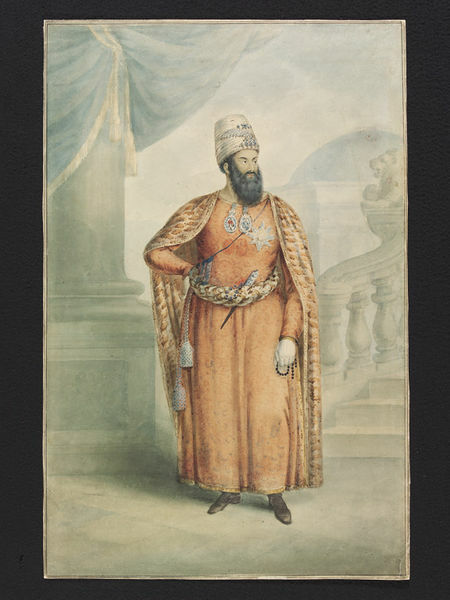 In addition, the column on the left suggests that the artist was familiar with Sir William Beechey's portrait of Mirza Abul Hassan Khan, 1810 (India Office Library, London). See Searight Archive.